The Vikings for Life movement is now implementing this project. Caroline Hawthorne, Mary Rouse, and Paul Pendleton. Sarah Fleenor, the lucky winner of the grand prize for the Stone Castle Rejuvenation raffle, proudly accepts her $5,000 from members of the Stone Castle Rejuvenation committee. Congratulations, Sarah! Thanks to all who purchased raffle tickets to support this community effort! BRISTOL , Tenn. — Tennessee High School supporters will soon have a new legacy outside the gates of the historic Stone Castle stadium. “The Legacy Wall” is being erected just yards from the 77-year-old fortress and is being included as part of phase one of a three-phase, $3.2 million project to repair and refurbish the landmark. Built as part of the Works Progress Administration, it was named to the National Register of Historic Places in 1987. 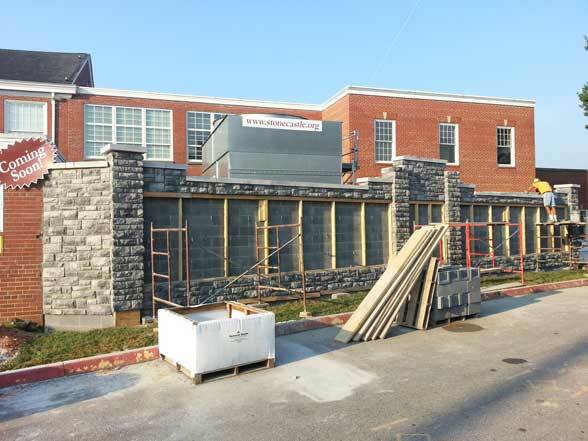 The mission of the Stone Castle Rejuvenation Project is to maintain and preserve the historic integrity of the Stone Castle while improving its functionality and usability for the betterment of our students and the Bristol community. Interested in contributing financially to the project? See how on the Donate page.